It's Rhonda here today to share a fun back to school card with you featuring our all new "Pattern Perfect" school themed collection. The ruler paper was used as my card base and I inked the edges with Java PowderPuff Chalk Ink. Then I added a layer of black cardstock and inked it with Coconut. I thought this itty bitty vellum quote was just perfect for this card. Our oldest goes to Kindergarten this fall and this card is going to be given to his teacher as a "Thank You - I'm so excited to be here." card. 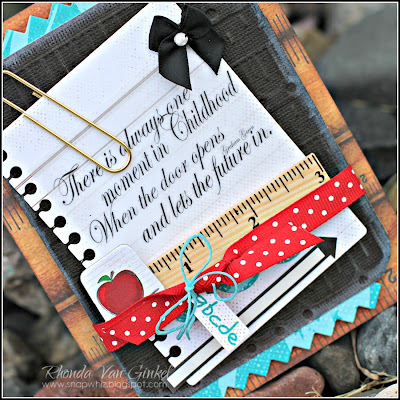 Other: Ruler by Maya Road, Arrow by Little B, Dies by MFT and Spellbinders, Mini Tag punch by Stampin Up, Black Cardstock by Core'dinations and twine. Thanks for popping on over today! Have a super weekend!!! I like how the coconut ink on the black cardstock gives it a chalkboard feel. Adorable card - love the layering!